In 1927 a movement to start the Village of North Hills began. This history, however, began long before that event. Long Island is the result of a large glacial movement that started in Northern Canada and ended here on Long Island. The topography of our area, rugged terrain and steep shorelines, is the result of the final boundary and subsequent melting of the glaciers. The Shelter Rock located on Shelter Rock Road was left as evidence of this event. This rock is the largest glacial boulder on Long Island. It is about 54' x 40' x 16' in size. It weighs about 2600 tons. By the end of World War 1, it was the most photographed rock formation in the United States. Located on the John Hay Whitney property, there have been many legends told of this rock. One time known as Millstone Rock, children were told tales of Billy the Kidd's treasure being buried there. Noted archeologists have found the site of Shelter Rock to be a favorite Indian habitat many thousands of years ago. Numerous Indian arrowheads, pot shards, and other artifacts were found below the ground. Pottery fragments found by Carlyle Smith in 1946 were classified to be part of the period 1000 and 1100 A.D. Other double ended arrowheads from pre Ceramic era indicated the Shelter Rock site is one of the oldest Indian habitation places ever found on Long Island. It's natural overhang made a perfect shelter for the Indians. The Matinecoc Indians were located in this area at the time of the first settlements of Long Island. Where the Indians settled, woods were burned to clear land. One Matinecoc Village was located near the southern end of North Hills. Tackapousha, the chief for all tribes on Long Island lived a few hundred feet northeast of Shelter Rock. 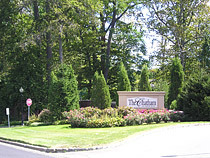 In 1643 Robert Fordham and John Carman, religious leaders from Connecticut, purchased all the land now known as North Hempstead. The settlers built a fence across the base of Manhasset Neck. The north side was for a cow pasture, the south side for farming. North Hills was part of the south side, thus the next era of North Hills was born, farming. One noted farm was the Schenck farm, part of the northern section of North Hills. The house was built about 1685 and was located where Lord & Taylors' parking lot is now located. The house was later moved to Old Bethpage. The farm land extended into the northern portions of North Hills. The other farmhouse built before the revolution was the home of Thomas Smith. Now the Links residential community, it was remodeled in 1860. From 1848 to 1898 the house was the farm of Isaac Underhill Willets. I.U. Willets was a large landowner for whom the road is named. It bisected his property and he was not pleased when it was built. At the turn of the 20th Century about a dozen families acquired large holdings in our area. A new era of North Hills began and would remain until the 1970's estates. The gatekeeper's cottage, built 1916-1920, had been rescued from demolition by a Port Washington couple who dismantled the house and moved it to a different location. Victor Emmanuel of the Italian Royal Family lived in the house that is now Our Lady of Grace Convent. As roads were built North Hills boundaries were established. The land east of Searingtown Road is now Christopher Morley Park and High Point condominiums. They were formerly the estates of Thomas F. Ryan, Assistant Secretary of War under Wilson and Louise Grace. The Fred W. Allen estate and the adjacent Edward W. Harkness estate are now part of the North Hills Country Club. The old Grace estate is now Deepdale Country Club. Land south of what is now the Long Island Expressway was part of the Fred W. Allen and Janet Grace Estates. In 1929, the landowner's mindful of the development of the surrounding area, decided to incorporate with lots zoned to a two acre minimum. The first meeting of the Trustees was held September 26th, 1929 at the home of Joseph P. Grace (now Deepdale Country Club). L.H. Sherman, the prominent lawyer, was the first mayor. His home is now Buckley Country Day School. The other trustees were Roger C. Elbert, Joseph P. Grace, Nicolas F. Brady, Fredric W. Allen and Malcolm P. Aldrich. The "Gold Coast" was North Hills, The beautiful estates and golf courses made the village a noted address of many prominent families. North Hills remains a beautiful, picturesque and wonderful community for residents to live in.